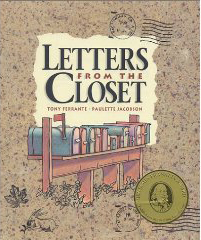 Bainbridge Islanders Tony Ferrante and Paulette Jacobson are co-authors of the 1994 Letters from the Closet. The book tells the story of Adam and Katie, a couple who is engaged to be married but ends up separating. When they meet later in life, Adam is a priest and Katie lives happily with her lesbian partner. The book is described on amazon.com as "a beautiful story of coming out and learning to love genuinely. It addresses issues of parents, children, gender, religion and other subjects. The story is told through their correspondence, cleverly reproduced here in beautifully illustrated postcards that can be slipped out of hand-crafted mailboxes and soulful journal entries. The reader, regardless of sexual orientation, will identify deeply with this emotionally moving story of romance, personal growth and overcoming the obstacle of prejudice in our society."